Beer label collecting continues to grow in popularity, and for good reason. There have been 1000's of breweries in the U.S since the 1870's and most of them have sold bottled beer. The beer bottle labels they produced have been favorite souvenirs of collectors since the first breweries opened. Many of the labels collected over the years have survived in perfect condition and today there are numerous avid beer label collectors. Beer labels were first used some time around the end of the Civil War (1870's). During this time the printing processes were rather simple, but each brewer wanted to distiguish his brand of beer from that of his competitors, thus the need for labels arose. Towards the end of the 1880's the stone lithography processes became more advanced and many label designs became quite elaborate. 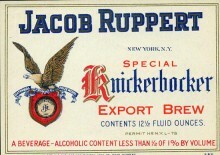 The pre-Prohibition labels from the 1880's to early 1900's are some of the rarest and most prized labels sought by collectors today. It wasn't until Prohibiton that beer labels saw their next major change. When National Prohibiton took affect in 1920, many breweries went out of business for good. Those that tried to survive were forced to produce low alcohol beer and malt products. Some breweries sold anything to stay afloat including: soda, ice cream, malt, yeast and even chewing gum. The "Beer" labels of the Prohibiton era were not allowed to reference the word "Beer" or anything similar (Ale, Lager, etc. ), and all breweries were forced to rename themselves to remove the word "Brewing" and "Brewery". Although Prohibition lasted only 13 years there were a wide array of Prohibition labels produced. Prohibition ended in 1933 and the breweries that survived were eager for business. The beer labels produced during the mid-1930's until World War II were perhaps the the largest variety and most colorful beer labels ever to be produced in the United States. Labels printed from 1933 to 1935 were required to carry a Federal Permit number. The permit was state and brewery specific. The U-Permit label featured many intricate label designs and today's collectors highly value many of the U-Permit beer labels. These U -Permit labels were also required to carry an IRTP statement. The Internal Revenue Tax Paid (IRTP) labels were produced from 1933 to 1950. This was another statement required by the IRS and the end of the IRTP labels marked the end of a great era of graphic and diverse beer labels. By the 1950's National breweries began to take over the market and most small regional breweries went out of business for good. Today many beer label collectors concentrate on pre-1960's labels and there are also collectors who specialize in microbrewery beer labels. Since the 1990's there has been an explosion of small microbreweries throught the U.S.. They produce craft beers with custom design labels for their unique brands. It seems the brewing industry and beer labels have come full circle from their beginning over 125 years ago.